Complete Door Rope Seal Pack for ESSE 100 & ESSE 200 stoves. Pack includes replacement Door Rope Seals, Glass Gasket, High-Temperature Adhesive, Screws & Clips. 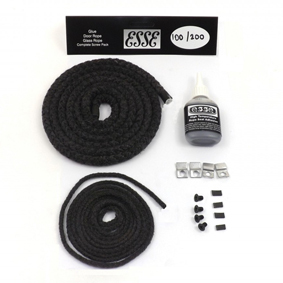 This service kit is a genuine ESSE part and is suitable for single door ESSE 100 and 200 models only. For top tips on how to replace your ESSE rope seals, watch this helpful video.